In April, at PSI's co-called IAMRECON (= Inter-American REgional CONference) in Mexico City there was not only a workshop on LGBT(I) union issues (and a meeting of the American LGBT Network in PSI), but also the Latin-American premiere of the movie "Pride" - a movie about the actions of the Lesbians and Gays Support the Miners group and the striking miners in 1980s Britain. This was a big hit at the conference. 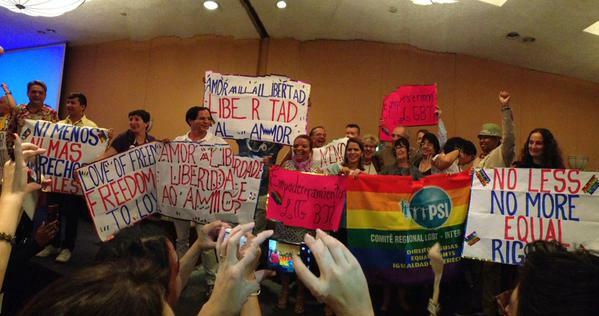 The LGBT network presented its actions at the last day of the conference at a plenary meeting. In May, on IDAHOT (May 17th), ILO Director-General Guy Ryder declared that LGBT workers are entitled to equal rights and benefits at the workplace. Read his declaration here. Also in May, 2015, the ILO published a study on work discrimination based on sexual orientation or gender identity in Argentina (in Spanish). Read more here. At the World Congress of Education International (EI), in July, 2015, an LGBT caucus was organised. For a short report of it (in French, en français) click here.